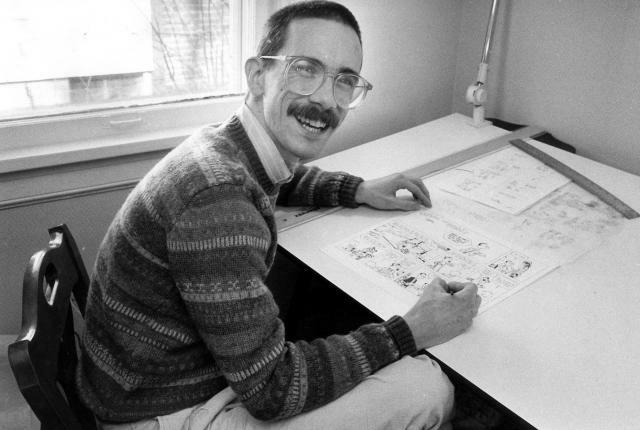 Bill Watterson created one of the most indelible parts of literature and pop culture in the late 20th century, the comic strip Calvin and Hobbes. Begun in 1985 and ending its run in 1995, Calvin and Hobbes took its readers onto a magical journey – one that nobody wanted to end. Adding to the intrigue – Bill Watterson has become Salinger-like in his isolation. Interview requests are routinely declined, very few photographs exist of Watterson, and he has yet to speak at length about Calvin and Hobbes. Very few licensed products actually exist of Calvin and Hobbes. There’s the books, a couple of calendars, a super-rare T-shirt, and recently, an US Postal Service stamp. No toys exist. Watterson has routinely rejected all licensing offers and movie adaption proposals. Looking for Calvin and Hobbes was originally published in 2009. It’s now five years after its initial publication, and while some things have changed – others haven’t as well. Nevin Martell does an excellent job of outlining these issues and why it’s so hard to track down Watterson. Only a handful of interviews had ever been granted by Watterson, and not much had been heard from him since the retirement of the comic strip in 1995. Watterson had given an interview in 1989 to Richard Samuel West of The Comics Journal (Issue #127, March 1989), and then gave a speech at the Ohio State University Festival of Cartoon Art on October 27, 1989 entitled ‘The Cheapening of the Comics’. Since then, Watterson had kept quiet until another interview with the Cleveland Plain Dealer in 2010 (after the publication of Looking for Calvin and Hobbes). While Martell pursued Watterson for an interview, he did also pursue Watterson’s contemporaries, peers, and even relatives. Watterson has since granted brief interviews with The Washington Post, Mental Floss, Stripped, and The Ohio State University’s Billy Ireland Museum of Cartoons. While Martell hoped for that elusive interview with the man himself, the reader will not be disappointed by the treasure trove of primary research and interviews that Martell was able to secure, especially with Berkeley Breathed of Bloom County fame. What did disappoint me however, was that this book was supposed to be a literary studies book. It’s not exactly that. It’s also not exactly a biography. Nor is it a memoir. It’s a strange amalgam of all the above, along with a travelogue and thrown in for good measure. While Looking for Calvin and Hobbes is an entertaining read for Calvin and Hobbes superfans, it’s not of much use for non-fans. There’s also no direct use from the book’s narrative apart from gleaning some new tidbits about Watterson and the perception of the man by others. I can’t recommend this book without reservations, since there are huge caveats when attempting to propose someone else read what essentially amounts to one fan’s obsession with finding Watterson for a chat about Calvin and Hobbes. There’s no true strip analysis or criticism provided, and it’s not a biography per se. What I can say is that it appears that Martell jump-started three different recent projects related to Calvin and Hobbes, probably due to renewed interest that his book may or may not have generated. There was the legendary Ohio State exhibition from September 10, 2001 to January 15, 2002. Commentary from this show was included in the Calvin and Hobbes book, Calvin and Hobbes: Sunday Pages 1985-1995. I always wished that I could have made that show – as did many others, I’m sure. The Cartoon Library and Museum still has its “Sunday Pages” exhibit in frames and could very well show it again or run a completely new exhibit from its Watterson archives. Personally, I’d love to see an exhibit that celebrated the four seasons, which Watterson always drew with such beauty and vitality. Exploring Calvin and Hobbes curated by Jenny E. Robb (pictured above, photo is from the Billy Ireland Cartoon Museum. The exhibit does include seasonal art highlights (as can be seen on the walls above). Running from 22-Mar-2014 to 03-Aug-2014, this new exhibit includes some of the old pieces from the former exhibit and some new highlights, allowing all Calvin and Hobbes and Bill Watterson fans that missed the first exhibit a chance to visit and see the artwork on display. Dear Mr. Watterson – A documentary film about the impact of Calvin and Hobbes. Teaching With Calvin and Hobbes – The rarest book involving Calvin and Hobbes, it regularly sells in four-digit range. Obviously, all us Calvin and Hobbes and Watterson fans owe a debt of gratitude to Nevin Martell for writing this book in the first place, laying the foundation for all the new material being produced now. If you’re interested in learning more about Calvin and Hobbes and its impact on people, then certainly pick up this book and read it. It’s mainly written in a conversational style, not an academic style. There’s personal references peppered throughout – I didn’t really need to know that Martell combined the trip to Ohio to visit friends of his while doing research. If the personal tidbits had been excised from the book, and replaced with some literary exploration of certain strips – I think the book would have been far better off.